If Seattle can be considered to have distinct “Uptown” and “Downtown” music scenes, you could perhaps call this a meeting of the two tribes. The superb Seattle Chamber Players join Wayne Horvitz, Bill Smith, Stuart Dempster, and Trimpin to play new open form works by these Seattle mavericks, along with group improvisations and conductions. This stellar line-up is made even more so by the presence of Julian Priester, Eyvind Kang, Peggy Lee, and Dylan van der Schyff — all compelling figures who blaze new trails and bulldoze the walls between supposedly separate musical worlds. Wayne Horvitz (keyboards) has for almost 30 years been one of the country’s key innovators at the boundaries of jazz and other forms of American music. Bill Smith, (clarinet), a man who over 60 years in music has been so creative that he had to devise two monikers just to contain it all — Bill Smith, for his jazz work, particularly his long association with long-ago Mills College classmate Dave Brubeck, and William O. Smith for his acclaimed explorations in new music — has demonstrated in all forms of his music a virtuoso technique balanced by a poise and humility that have inspired many. Stuart Dempster (trombone) has been a guiding spirit for thousands of area musicians and has steadfastly championed a free spirit in musical creation — merely by exemplifying one, and by lending it to a vast range of performance occasions and types. Trimpin is an internationally acclaimed original, an engineer of stunning precision and ingenuity known for his large-scale, computer-controlled sound installations rigged with everything from electrified piano strings to dripping water to clicking, clacking mechanical gizmos worthy of Rube Goldberg. Since his stint as a youth with Sun Ra’s majestic Arkestra, Julian Priester (trombone) has enacted the spirit of the intergalactic jazz wanderer in a succession of high-profile settings, as well as in projects with young acolytes in his longtime adopted Seattle home. To call Eyvind Kang merely a violinist, or violist, simply doesn’t suffice. He has explored and assumed a vast array of musical traditions, delving not as an ethnomusicologist but as a devotee of mystical arts to arrive at a succession of transporting albums that are as highly evolved as they are idiosyncratic and mysterious. Joining these Seattle mavericks are two Vancouver ringers, cellist Peggy Lee and drummer Dylan van der Schyff, first-call accompanists to every maverick who has ever come unaccompanied to an iteration of the astonishing, annual Vancouver International Jazz Festival. 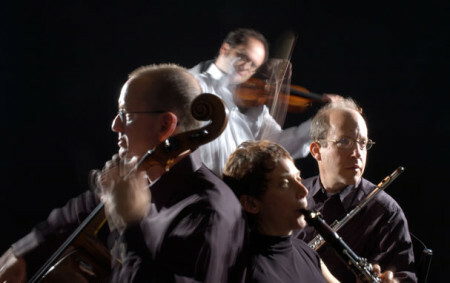 Accompanying them all are the Seattle Chamber Players — Laura DeLuca, clarinet; Mikhail Schmidt, violin; David Sabee, cello; and Paul Taub, flute — four of the most intrepid and gifted of musical explorers on the city’s vibrant contemporary classical scene.